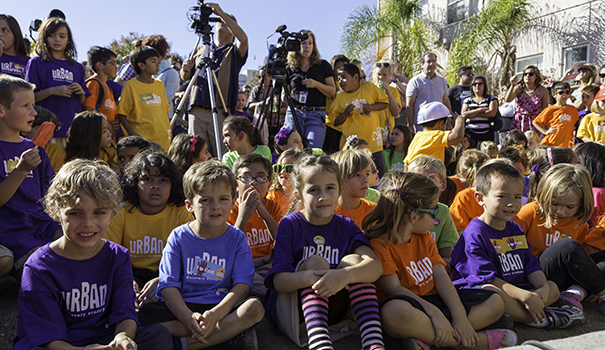 Since opening its doors in 2008, Urban Discovery Academy has garnered attention across San Diego with its project-based learning model, higher-than-average test scores, a vigorous fundraising appeal and annual wait lists for student enrollment. The privately run K-8 school — chartered by the San Diego Unified School District (SDUSD) — is about to enter a new chapter in its short existence. After seven years of bouncing between different venues, Urban Discovery Academy is going to kick off its 2015-16 school year next fall with new, permanent digs. Current Urban Discovery Academy students were among the approximately 400 people who attended the groundbreaking ceremony. Approximately 400 people attended a groundbreaking ceremony Oct. 24 at 14th and F streets in East Village — the site where the new 36,000-square-foot facility will be located. Leaders of the school attended the event, as did organizers from a number of Downtown civic organizations. Also on hand were several city officials, including Council President Todd Gloria. MaeLin Levine, Urban Discovery Academy’s board president, said the multi-story complex is the realization of a long-held goal for the school’s leaders. The project entails a hybrid mix of renovating an existing building and adding onto it with new construction. While a permanent site has been in the works for several years, a number of factors recently came together and brought the project to fruition. The San Diego Community College District helped secure the new site, and Urban Discovery Academy’s board sold $10.5 million in bonds to fund the construction and renovation work. 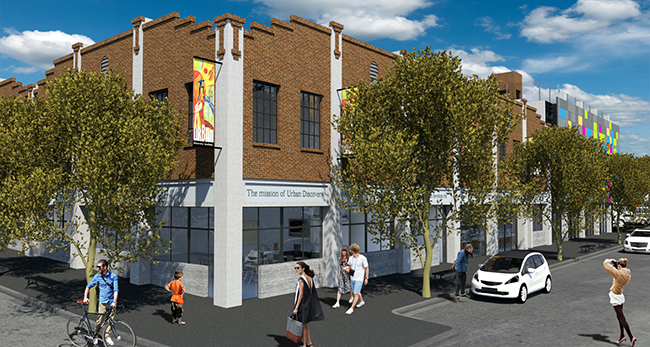 Urban Discovery Academy currently operates out of a vacant building owned by SDUSD on 45th Street in Chollas View. In the prior six years, the charter school also rented space on Sixth Avenue, across from Balboa Park. When it came to choosing a permanent location, a number of options were explored, but Levine said a Downtown spot was long on the wish-list. While this year’s class of 463 students hails from all across San Diego County, the bulk of the attendees live Downtown. The school attracts a waiting list annually, and preference is always given to youngsters living in the heart of the city. Levine described the new facility as “state of the art” and said the layout will give teachers and other staff members more of an opportunity to carry out some of school’s missions, including an interactive style that enables younger students to mingle with middle schoolers. Civic organizations, including Downtown San Diego Partnership (DSDP), have lauded the imminent move. 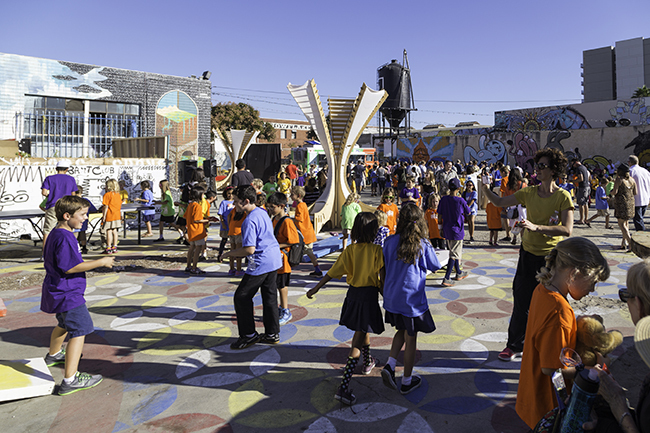 Kris Michell, president and CEO of DSDP, said Urban Discovery’s permanent rooting in the community is the result of an oft-heard sentiment — residents have wanted a middle school in the Downtown area. Beyond the middle school factor, Michell said Urban Discovery Academy will fit perfectly into the Downtown landscape. Urban Discovery Academy’s new location will be just a few blocks from the new central San Diego Public Library, which doubles as the venue for the recently-launched e3 Civic High School, which encompasses two full floors of the nine story library. Other nearby institutions include the NewSchool of Architecture and Design and San Diego City College. For more information, visit urbansd.com.